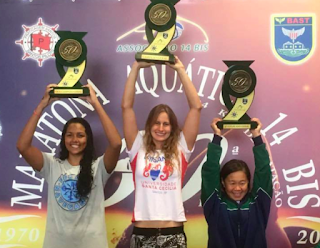 Courtesy of Guilherme Freitas, Swim Channel, Brazil. Artur Pedroza and Catarina Ganzeli won the 50th edition of the Maratona Aquática 14 Bis, one of the most competitive open water races in Brazil. The 24 km race is held in the Bertioga Channel between the island of Santo Amaro (Guaruja) and the Brazilian mainland near São Paulo. Ganzeli had race previously in 2008 and won the event for the first time while Pedroza won as he had in 2015. 300 swimmers came from all over Brazil, facing cloudy, rainy conditions. Pedroza told Swim Channel of his 5 hour 9 minute victory, "I was able to execute my plan and everything went well to plan. We caught a current that was more constant and resulted in higher tempo for all swimmers. I am also very happy that four other members of Resende Águas Abertas who completed the race, which has made me very accomplished as a coach and an athlete." 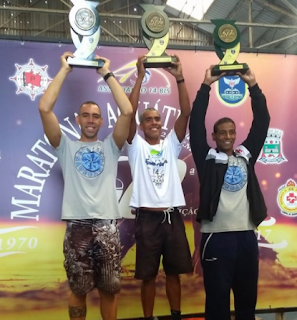 Luiz Felipe Lebeis and his disabled-but-prolific open water swimming teammate Carlos Rosa, both of Team Navegantes, finished second and third respectively. Ganzeli outsprinted Rosa down the final stretch to culminate an outstanding 2017 season with a 5 hour 22 minute time. "I had the best race of my life. I was very conscious of my strategy, since I knew that I would swim much of the race together with the men. I was able to follow Artur and Luiz for a while, but I ended up getting tired and dropping a bit behind. In the end, I managed to get in the draft of Carlos and had a sprint at the end to finish in third which was a very important accomplishment for me." 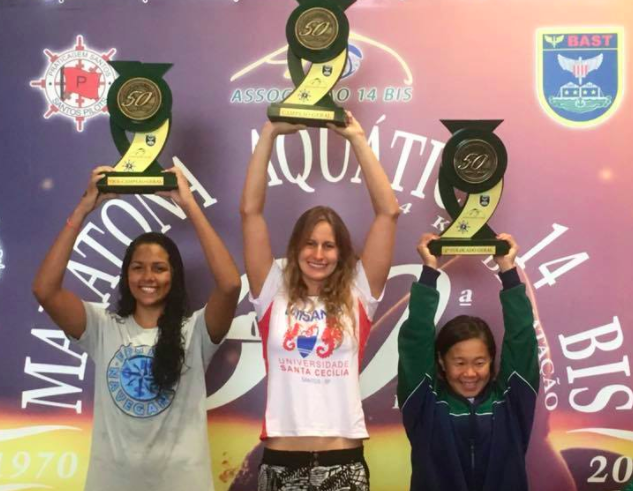 Beatriz Pucciarelli, another swimmer from Team Navegantes, finished second with Ana Lícia Maki Sudo in third.